Newsflash! God hates me! Throwback Thursday – Jimmiejoe from a long time ago. 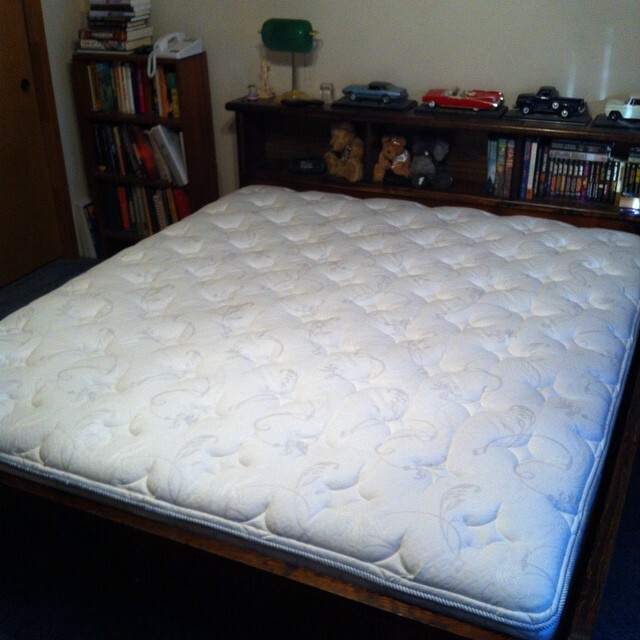 The new mattress sits nicely in the waterbed frame. So, after about 40 years of waterbeds, I took the ‘plunge’, so to speak, and bought an actual mattress. Even with the occasional stays in hotels, I wasn’t quite sure whether this idea would float or not. I had really been spoiled by my waterbeds, and wondered if I would find a regular mattress comfortable enough to stick with. 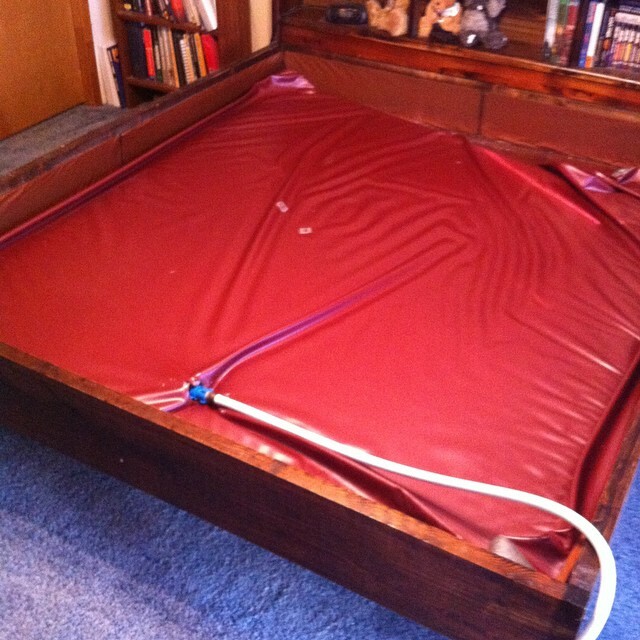 I first acquired a water bed back in the mid 70’s, while I was in high school. My first was a California King, with plush white ‘leather’ padding on the headboard, footboard, and side rails. One of our cats at some point decided to ventilate the headboard by sharpening her claws on it, but fortunately never tried that with the mattress. I had that bed for 15 years or so. I bought the bed you see here next, another California King, and have had it ever since. 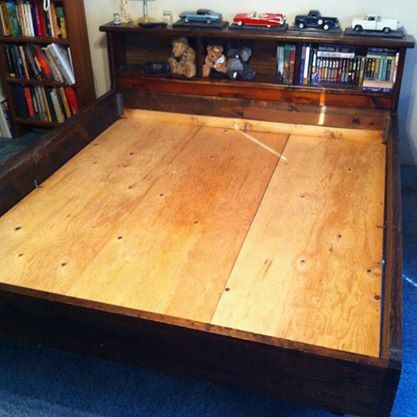 Now, I’ve loved my waterbeds through all these years. Soft, warm, and comfortable as anything I’ve ever slept in, it was a huge decision to give it up. The time had finally come, however. I had been thinking about getting a regular mattress for some time, as I had been noticing a tendency to some lower back pain if I stayed in bed too long. As I really love lazing around in bed before getting up to start my day, this was proving to be a problem. There are some other considerations that factored into the decision as well, but lets just say that waterbeds can sometimes be a challenge in romantic relationships and leave it at that. It seems it was time to make the change. I did some online searches and found a Sealy California King on sale at Sears, for $1,000 off the ‘suggested’ retail price. A quick online form was filled out, my credit card took a hit, and a delivery was scheduled. I’ve had the bed for just over a month now, and I think I’m pretty satisfied with it. The biggest problem I experienced with regular beds during hotel stays was keeping warm, but that hasn’t yet proved to be an issue with this bed. While I do miss the gentle rocking of the waterbed, the firmness of the mattress is more comfortable than I expected. Hotel stays, with only one or two exceptions, had seemed like sleeping on boards, or on the floor. I’ve not felt like that with this change. Empty waterbed frame waiting for the new mattress. New sheets added to the adventure, and I’m becoming more and more acclimated to my new sleeping arrangements. I still find myself sitting on the edge of the bed, sometimes, and unconsciously trying to adapt to the expected wave motion that is no longer there. Also, rolling over in bed is a new experience, and has taken a bit of adjustment to get used to. So now waterbeds are a thing of my past, and will probably remain so. I’ve kept the mattress, liner, and heater, though, just in case. You never know when I’ll wax nostalgic, and decide it’s time to get all retro and hipster, and fill that puppy back up. Groovy, man.